SDCAP is excited to share with you one of several projects headed to Burning Man that has been awarded a 2019 Collaborative Arts Grant! Look for updates to this post as fundraising and the build get underway. Lead Designer: Ramiro Martinez Jr.
Life can sometimes feel as though we are aimlessly traversing through the dust while we try to get to our destinations. The path is not always clear or visible, or for that matter, the path may not even exist. A bridge is defined as a structure carrying a pathway or roadway over a depression or obstacle. A bridge is also defined as a time, place or means of connection or transition. Traversing Through Dust aims to remind participants that the means for transition/bridges are ours to create. In the end the decisions and self-reflections we make, pave the path to where we want to be and whom we choose to become. 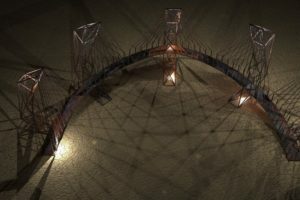 Out of the dust citizens of Black Rock City will see a metal bridge made up of 5 towers with 6 decks suspended from the towers. These decks will be made of wood and held up with lifting cable. Decks will start at ground level. They will rise to a height of 20 feet. The bridge will take up 6 sides of an octagon. Participants will be able to interact with lights which will be attached to the towers. The lights will produce shadows and trail effects that will cause participants to question their reality. Participants are encouraged to write on the structure about their experience at designated locations. Participants will be able to climb the structure. The MATH Collective is comprised of a talented group of individuals ranging from the fields of architecture, engineering, mathematics and electronics. Our Design team includes San Diego Community Members: Mark Anderson, Max Elliott, Diane Hoffoss, David Timms, Brenda de la Cruz, Jazmin Arredondo and Ramiro Martinez. Collective project experience includes the following projects, Wonderlust Arcade, Critter Art Car, Unfolding Humanity, Cabina Exuro, Caroushell, Quemaduras del Sol, Starfish, Isis Pyramid and The Journey. Our mission is to bring new experiences to the community using Architecture, Engineering and Electronics that evoke the minds of Participants.